The Former Governor of Edo State and Presently the ApC national Chairman has kicked a public war against the Outgoing governor of IMO state, Rochas Okorocha. He said: "It is unfair to say that I am the cause of Okorocha's downfall, his greed and arrogance kept him where he is today". He Equally noted that Imo people publicly rejected him, there's no amount of wailing that can change that. 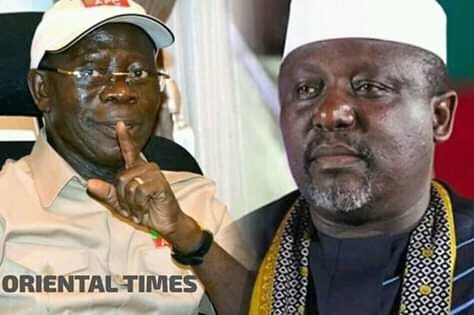 Oshiomole said he would even advice him to save his tears till after May 29 when Okorocha will be gripped to answer for all the evil he perpetrated in Imo State from 2011. Be that as it may, Owelle still remain my good friend, that is why I'll be passionate enough to bring him good food in Kuje". Eco City Reporters gathered that APC National Chairman, Adams Oshiomhole Fires Rochas Okorocha during his conversation with him in a meeting which was made available by Oriental times Media platform.